The first middle grade novel from internationally bestselling author Ally Condie comes to paperback. It's the first real summer since the accident that killed Cedar's father and younger brother, Ben. Cedar and what’s left of her family are returning to the town of Iron Creek for the summer. They’re just settling into their new house when a boy named Leo, dressed in costume, rides by on his bike. Intrigued, Cedar follows him to the renowned Summerlost theatre festival. Soon, she not only has a new friend in Leo and a job working concessions at the festival, she finds herself surrounded by mystery. The mystery of the tragic, too-short life of the Hollywood actress who haunts the halls of Summerlost. And the mystery of the strange gifts that keep appearing for Cedar. 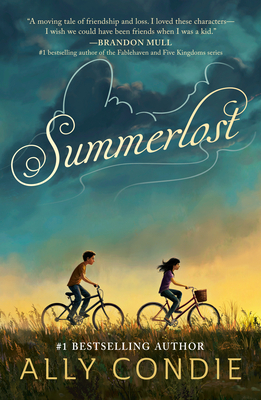 Infused with emotion and rich with understanding, Summerlost is the touching new novel from Ally Condie, the international bestselling author of the Matched series that highlights the strength of family and personal resilience in the face of tragedy. Great for fans of Bridge to Terabithia and The Thing About Jellyfish. Ally Condie is the author of the bestselling novel Atlantia and the critically acclaimed Matched trilogy, a #1 New York Times and international bestseller. The series has been published in more than 30 languages. A former English teacher, Ally lives with her husband and four children outside of Salt Lake City, Utah. She loves reading, writing, running, and listening to her husband play guitar.